currently under construction at 2878 Piedmont Road Northeast, Atlanta. Sales for available units range in price from $795,000 to $815,000. Piedmont Garden Hills has a total of 12 units. Sizes start at 3100 square feet. Garden Hills is a large urban forest neighborhood lying in the heart of Buckhead between Peachtree and Piedmont roads, bordered on the north by Pharr Road and on the south by Lindbergh Drive. Garden Hills captures the essence of gracious urban living with its winding streets lined with old trees, an imposing mix of early 20th century homes dating back to the 1920’s, pocket parks, landscaped traffic islands and a neighborhood pool/recreation center – all convenient to shopping, dining, transportation, schools and churches. The oldest streets were given historic district status in 1987. Eclectic homes characterize the neighborhood, with houses ranging from Georgian, Tudor and Spanish Revival to Craftsman in the older sections. Streets south of East Wesley, developed after the Second World War, are predominately ranches. There is also a scattering of later style homes throughout. 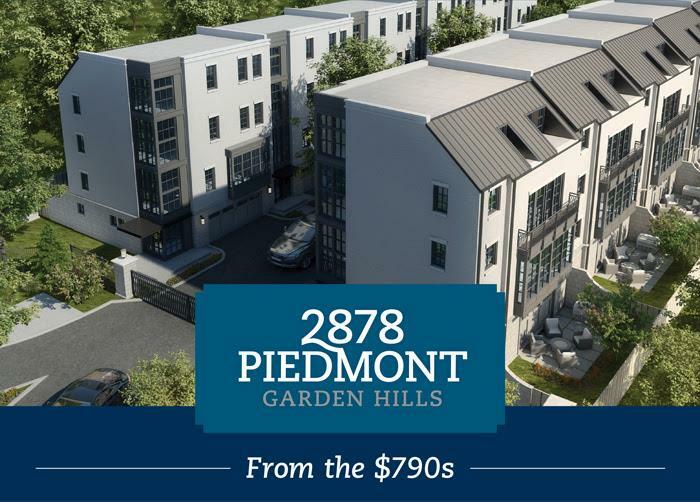 Your inquiry will be delivered to the Piedmont Garden Hills sales team, who will send you more information about this development.